With all of the attention grabbed by Pluto in recent months, it's easy to lose sight of just how much exploration is actually taking place across the solar system. Lately, most of the news has come from NASA's New Horizons flyby of Pluto, Cassini's ongoing investigation of Saturn and its enigmatic moons and the Curiosity rover's geologic quest on the slopes of Mount Sharp on Mars. The European Space Agency's Rosetta spacecraft and Philae lander are carrying us on a roller coaster ride around the sun on Comet Churyumov-Gerasimenko. A small fleet of solar observatories like NASA's Solar Dynamics Observatory and the ESA's SOHO keep an unblinking eye on our tumultuous sun. In fact, there are dozens of robotic spacecraft spread across the solar system, quietly exploring objects and regions from Earth's moon all the way out to the frontier of interstellar space, three times more distant than Pluto. 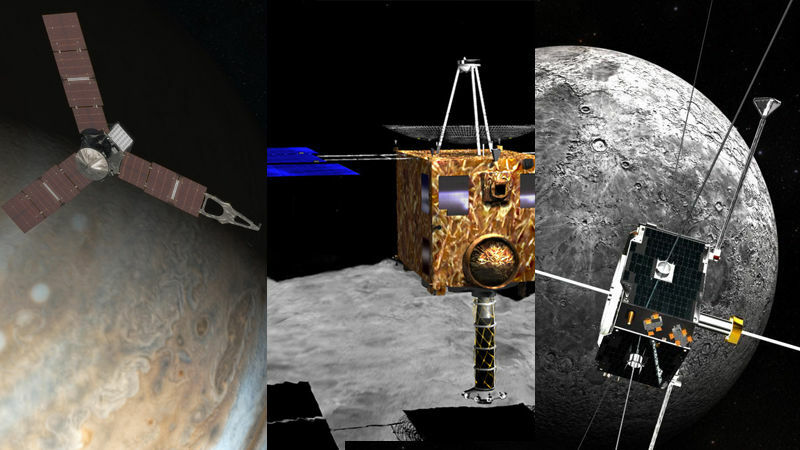 Below are three current space expeditions that may yield results as soon as next year. Asteroid Expedition: Orbit, Land, Rove, Return! Have you heard of Hayabusa 2? Launched by Japan last December, this spacecraft is currently en route to the near-Earth object 1999 JU3, where it will arrive in 2018. 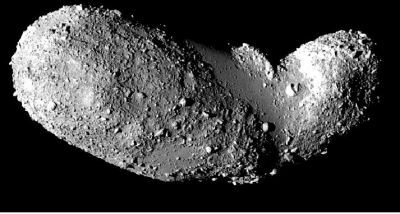 The spacecraft will spend about 18 months examining this half-mile-wide asteroid and employing a variety of exploration technologies, including deploying a lander and a rover to its surface, creating and exploring an artificial crater with an impactor projectile and the lander, and ultimately returning samples of the asteroid to Earth. Sounds like a novel mission, but in fact this isn't the first to bring pieces of an asteroid home to us; Hayabusa 2's predecessor, Hayabusa (1), collected and returned samples of the asteroid Itokawa in 2010. And 1999 JU3 is a "C" type asteroid, a carbonaceous object composed of clay and silicate rocks. Though C-type asteroids are the most common (75% of asteroids are of this type), they are among the oldest objects in the solar system. They are also thought to contain organic material and water (in hydrated rock). These two factors—their origin in the earliest times of the solar system's formation, and the water and organic molecules they may contain—can provide clues of how a planet like the Earth formed, in particular in relation to Earth's oceans and the emergence of life. Did you know that the green "reuse-recycle" ethic is occasionally employed with space missions? This is the case with ARTEMIS—a mission you may not have heard of even during its first incarnation. ARTEMIS (Acceleration, Reconnection, Turbulence, and Electrodynamics of the Moon's Interaction with the Sun) consists of two spacecraft that were originally members of another multi-probe mission called THEMIS. The original five THEMIS spacecraft orbited the Earth starting in 2007 studying its aurora, but two of the solar-powered probes were in danger of losing power due to spending too much time in Earth's shadow. Instead of falling into dark silence, these two were sent on a new mission to the Moon, and renamed ARTEMIS-P1 and ARTEMIS-P2. In 2010 the two repurposed spacecraft arrived at their initial destinations, the L1 and L2 Earth-Moon "Lagrange" points, where a balancing act between the Earth's and the Moon's gravity creates semi-stable "pockets" where spacecraft can dwell. L1 resides between the Earth and Moon, and L2 on the far side of the Moon. These Lagrange points reside outside of Earth's magnetic field, and so were excellent vantage points for the ARTEMIS spacecraft to study the properties of the solar wind and how it interacts with the Earth's long magnetic tail and the Moon's weak magnetism. 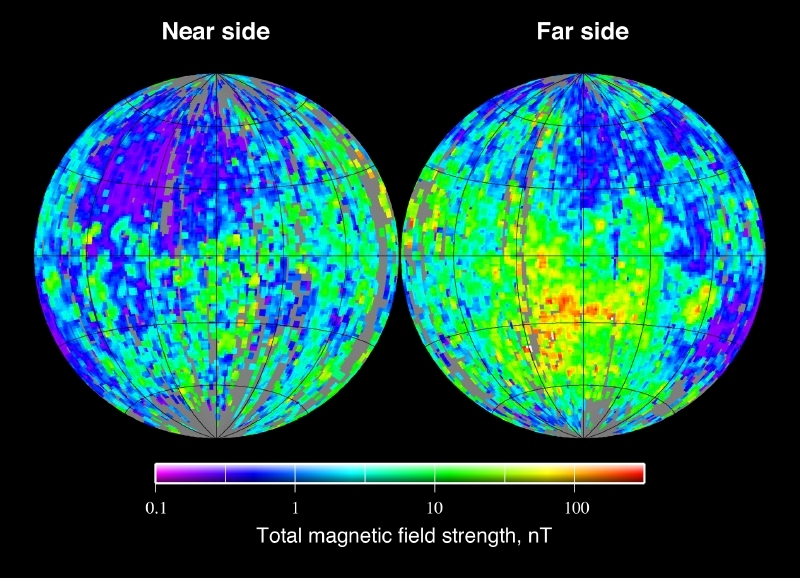 In 2011, both spacecraft were moved from the Lagrange points into close lunar orbits, and began a new phase of their repurposed mission to study the Moon more closely, including the structure of its core and its detailed surface magnetism. The ARTEMIS mission is still in progress. NASA's Juno mission also hasn't been on people's radar, but not because its mission isn't large. In fact, its mission objective is the biggest thing in the solar system, the planet Jupiter, where it will arrive in July of 2016 and enter a first-ever polar orbit of the gas giant. By investigating Jupiter's polar regions, the Juno spacecraft will make detailed measurements of Jupiter's powerful magnetic field where it emerges from within the planet, the structure of its atmosphere, and its gravitational field, giving scientists a glimpse of what's going on deep within Jupiter's thick gaseous layers and down to its core. 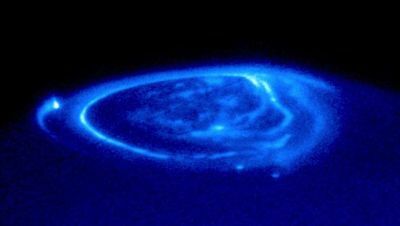 Probing Jupiter's interior structure may give us insights into how Jupiter formed, and by extension the history of the formation of other planets in the solar system. Five decades ago the first robotic probe to reach any place in the solar system beyond the Earth-Moon system, Mariner 4, flew by Mars, capturing and transmitting back to Earth less than two dozen images. Today, the playing field of solar system exploration is crowded. We're in for a treat as spacecraft gather information and help us better understand the world in which we live.